Silvassa, the capital of the union territory Dadra and Haveli is located a distance of 175 km from Mumbai. It used to be known as Vila de Paço d'Arcos under the rule of Portuguese, back in the 18th century. Due to the heavy influence of Portuguese rule, many Roman Catholic churches can be found here at Silvassa. Silvassa's culture, therefore, is a mixture of many places. It is home to a part of the Warli tribe so some speak Warli language, while some other speak Marathi or Gujarati. The beautiful city is filled with lush green and beautiful natural resources in general. The city is now turning into an industrial hub with industries like Apar, Ramco, Reliance coming up. Currently, Silvassa is competing against many other places to get funds for making it into a "Smart City". Mostly, monsoon and winter are the pleasant seasons of Silvassa. However, since commuting in monsoon might get messy and hard, winter months of October to February is a beautiful time to visit Silvassa. Read about the different places to visit on the way and in Silvassa. Thane is the first stop from Mumbai, located at a distance of about 23 km. Tikuji Ni Wadi and Sanjay Water Park located about 4 km from each are the two places that can be visited with the whole family. The place is sought after by many neighbouring cities for its wonderful water parks. It has all sorts of water rides and land rides, entertaining places like dinosaur world, and more. Portugal influence can be noticed even at the town of Vasai. Bassein is an English term used for the Portuguese word Baçaim. 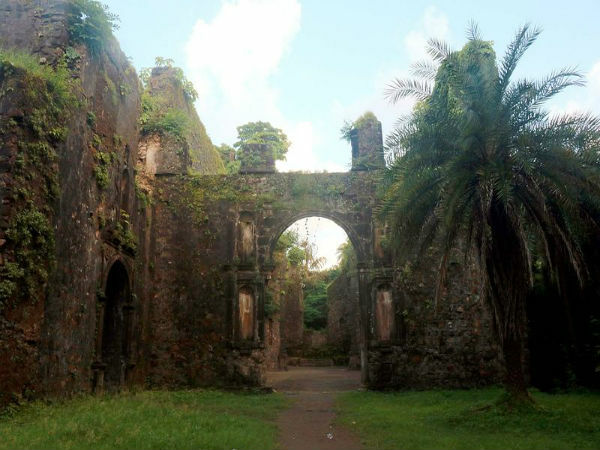 The Bassein Fort, locally known as the Vasai Fort, is a monument built in the 16th century, by none other than the Portuguese. Although it is now a ruined fort, the architectural marvel can still be seen in what's left of the fort. It now makes for a fantastic location for shoot and has been used by many Bollywood movie-makers. The Vaitarna River flows exactly parallel to the route from Mumbai to Silvassa, up to Manor where it breaks into many tributaries. In this stretch, many local services have captured the potential of the river and offer opportunities for exciting adventures. White water river rafting being the primary activity is available at this river. Kayaking, boating, river rappelling and some of the other water sports that can be availed from local services. Manor is known as the Gateway to Palghar, because it is the first town that comes in the Palghar district of Maharashtra. The quaint town of Manor is a favoured weekend getaway destination because of the peaceful beach that accompanies the town, along with lush green surrounding it. A few luxurious resorts are built around this beach, where you can relax with your family. The top tourist attraction of Silvassa is the lion safari at Vasona. Safari in a van amidst Asiatic Lions is an experience you must have at Silvassa. Part of the Dadra and Nagar Haveli Wildlife Sanctuary, this region is spread across an area of 25 hectares. The safari lasts for about 1-2 hours and is open on all days from 9 AM to 5 PM. Satmalia Deer Park is another place that can be visited to view deers, found just a few kilometres from here. Fondly known as "Island Garden" because of a little island found in between the lake, Vanganga Lake Garden is a mesmerising place that is surrounded by lush green, flowers and tranquil lake water. A bridge connects the surrounding pavements to the island in the middle. It is a favoured spot by joggers, tourists and even film-makers with over 40 Bollywood songs being shot at this very location! Hirwa Van Garden is a magnificent man-made garden, which makes for a perfect picnic spot. The name literally translates to "Green Forest", because of the greenery created by the man-made forests and gardens. An artificial waterfall creates a mystic atmosphere, with its cascading water. A separate play area for kids with swings, seesaws, etc is also available.